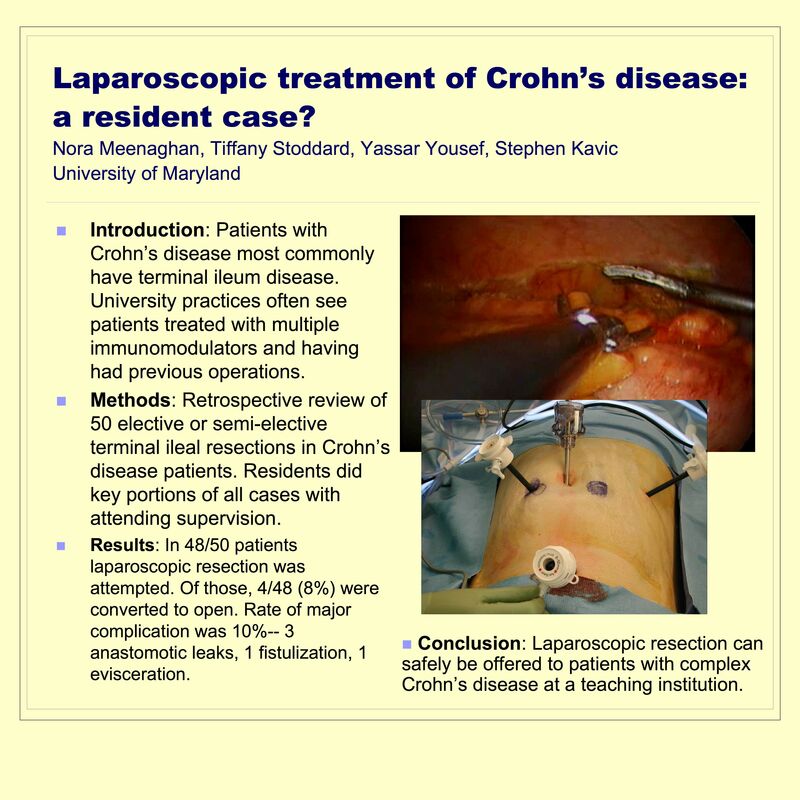 Laparoscopic Treatment of Crohn’s Disease: A Resident Case? Patients with Crohn’s disease are most commonly afflicted in the region of the terminal ileum. In a university setting, patients often present to the surgeon with advanced disease that has been treated with multiple immunomodulators, and often have previous abdominal operations. A retrospective analysis of 50 patients with Crohn’s disease undergoing elective or semi-elective terminal ileal resections were included. Residents took an active role in all surgical cases, performing critical portions of dissection and anastomosis under attending supervision. Among the 50 patients, 48 were attempted laparoscopically. Four operations were converted to open (8%). The overall rate of major re-operative complications was 10% – three anastomotic leaks, one fistulization, and one evisceration. There was no mortality. The benefits of minimally invasive surgery have been well established and extend to patients with complex Crohns disease. Laparoscopic resections may be safely offered with an acceptable rate of complications at a teaching institution.